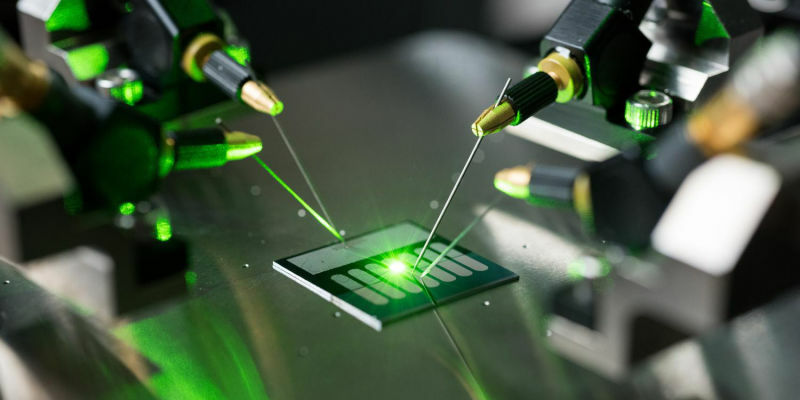 This fancy-looking slab is the world’s first optical rectenna, a small device that’s part antenna, part rectifier diode — and it’s able to convert light directly into DC current. Developed by researchers from the Georgia Institute of Technology, the device uses carbon nanotubes that act as tiny antennas and capture light. The light creates a fluctuating charge that travels through miniature rectifiers built into the walls of the tubes, which switch on and off at the rate of petahertz — that’s 1015 Hz, or 1 million times faster than a GHz. The result is a very small direct current, created directly rather than in a multi-step process like in most solar cells. In operation, oscillating waves of light pass through the transparent calcium-aluminum electrode and interact with the nanotubes. The metal-insulator-metal junctions at the nanotube tips serve as rectifiers switching on and off at femtosecond intervals, allowing electrons generated by the antenna to flow one way into the top electrode. Now, by building billions of tubes into an array, it’s possible to create a significant current. There is, however, a catch: right now, the devices made by the researchers are less than 1 percent efficient, which means very little of the light actually gets converted into electricity. Their research is published in Nature Nanotechnology. The team is now trying to develop ways to increase that efficiency, largely by reducing the electrical resistance within the devices, which they believe could easily be cut by “orders of magnitude” to provide efficiencies of up to 40 percent. At that stage, the obvious application for the devices is in directly harvesting electricity from sunlight — and the researchers agree. “We could ultimately make solar cells that are twice as efficient at a cost that is ten times lower,” says Baratunde Cola, one of the team, to PhysOrg.